Leprosy, poverty and a story of social exclusion are the unlikely ingredients for the deeply engaging and often funny road movie Yomeddine, which entered the competition for the Palme d’Or at the 71st Cannes Film Festival earlier today. Beshay (Rady Gamal) is a man who has recovered from leprosy but still bears the horrible scars of the disease that saw him abandoned by his family as a child to live his life in a leper colony. He scrounges for a living on the ‘mountain of rubbish’, the local dump, selling whatever he can find of value. But despite poverty and his condition, he is a cheery presence – “Hello sick people” he calls as he enters the colony that has been his home. 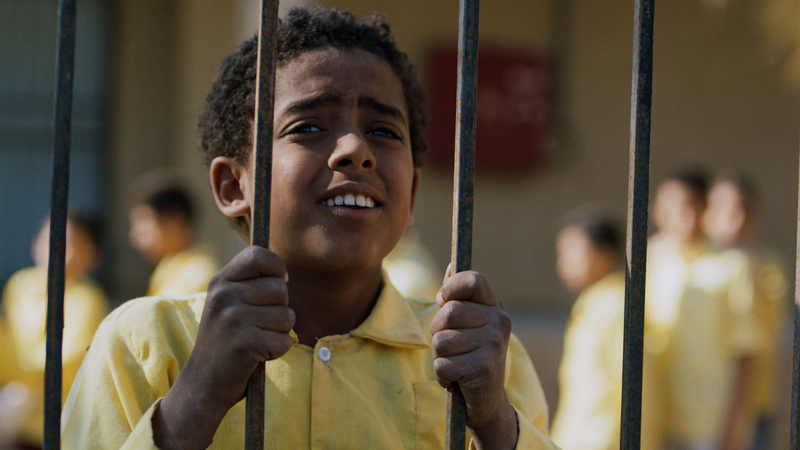 He also has a constant friend in a little orphan called Obama (Ahmed Abdelhafiz), who has a large stock of excuses for why he’s not in school. His relatively contented existence changes dramatically when his sick wife dies and he is visited by her mother. Lonely and driven by a need to find his own family, he sets off on an epic journey to the south with his cart and donkey only to discover Obama has stowed away in the back. The road movie that ensues is in part a picaresque adventure, Quixote-esque in its wrong-headedness and naivety as well as a portrait of an at times intolerant and hostile Egyptian society. Beshay’s appearance causes fear and consternation especially when Obama gets him to go for a swim in the river. Obama looks on the older man as his surrogate father. He has been beaten at the orphanage and has no idea who his parents were. The two enjoy a warm relationship, beautifully played by the non-actor leads, and they prove a necessarily resilient team as their meagre resources are soon exhausted and they begin to draw the attention of the police and authorities. With each episode, the film brushes against a different aspect of Egyptian society – professional beggars, a jailed fundamentalist Muslim – but humanity and humour is found in the most unlikely places and serves as relief to the ridicule and fear that Beshay is usually met with. ‘Yomeddine’ is Arabic for ‘Day of Judgement’, and if there is a message in writer-director A.B. Shawky’s debut film, it is that we should hold our horses before judging others. There will come a day when we are all equal, Beshay asserts. An obvious inspiration for this cry for common humanity from an outsider is David Lynch’s The Elephant Man, underlined by a moment in Yomeddine is when Beshay yells “I’m a human being” in a crowded train carriage. It’s too on the nose, but as such it is a rare misstep. In general, Shawky sees the good in people and humour, even in miserable conditions and poverty. He is helped by the down-to-earth charisma of his leads and the film takes its tone principally from Gamal’s performance in its determination not to flop into miserablist despair or, worst still, well-meaning pity. Instead, Shawky’s Yomeddine is an accomplished appeal for empathy and an entertaining journey of discovery.